September 2018—Santa Clara, California, USA— TRUMPower’s TMW7 USB series is compliant with IEC 60601-1-11 2nd edition standards for use in home healthcare applications. The TMW7 switching power adapters feature 90-264 VAC, 47-63 Hz universal input in fixed or interchangeable AC plug configurations. The fixed AC plug version meets IP22 rating. 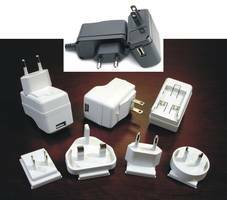 Structured with Class II insulation, there are 4 different types of wall plugs to meet worldwide requirements: US, EU, UK, and Australian. The units also have a low touch current of 10µA at 264 VAC/60 Hz. It comes with a USB type A receptacle on the case or molded output cable with mini or micro USB type A or B plug. The wall mount adapters are fully protected against overvoltage, over-current, and short-circuit conditions. The units can withstand 4000 VAC from input to output with 2 MOPP. With a typical efficiency of 75% and 0.3W maximum no load power consumption, they are compliant with CEC level V and ErP step 2. The adapters can operate at an ambient temperature range of -10°C to +60°C. Derating is required from 100% at +40°C linearly to 50% at +60°C. It has an MTBF of 300 KHrs minimum at full load, 25°C ambient, calculated per Telecordia SR-332. The TMW7 series is approved by UL, cUL and TUV to the latest medical standards, including IEC/EN/UL 60601-1 Edition 3.1, ANSI/AAMI ES 60601-1: 2012, CSA C22.2 No. 60601-1: 2014. The power adapter complies with IEC/EN 60601-1-2 4th edition medical EMC and immunity standards including EN 55011/CISPR 11/FCC class B (conducted and radiated emissions), EN 61000-3-2, EN 61000-3-3, EN 61000-4-2 (ESD at ±15kV air and ±8kV contact), EN 61000-4-3, EN 61000-4-4, EN 61000-4-5, EN 61000-4-8, EN 61000-4-11. Additionally, the fixed AC plug version is certified to IEC 60601-1-11 2nd edition for use in home healthcare environments. The TMW7 series is competitively priced in OEM quantities. For more detailed information, please visit http://trumpower.com/library/tmw7-usb.pdf or email sales@trumpower.com.